I hope my future "grown up" home has a kitchen with most of these attributes. Oh, dreamland, how I love you! love them! That is very similar to how my mom has her kitchen. You'd probably love it! Except she doesn't have too much color and hardwood. But it's VERY open, has so many cabinets, tons of window for natural light... etc. Yes! That seems just about perfect. Visit my blog at http://readersrandomramblings.blogspot.com/2010/10/8-for-8.html if you want to play along. 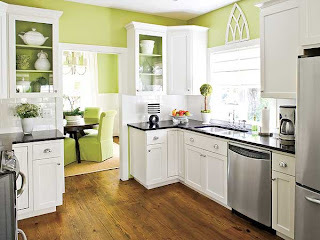 I am loving the green walls up against the white counters.